PLEASE NOTE: We’re combining both shows in to one night – Tuesday 7 October – with both Sauna Youth and Monotony, plus Waiters, playing. All tickets for Monday remain valid for Tuesday. We’re delighted to be promoting an intimate show for both Sauna Youth and their ‘evil twins’ Monotony! Sauna Youth are an evolving band of young future humans, making truly irregular punk not quite comparable to anything else. An ongoing music and art project based in London, the band is vehicle for them as a unit and individually to experiment with music, art, writing and poetry… OR just a punk band. 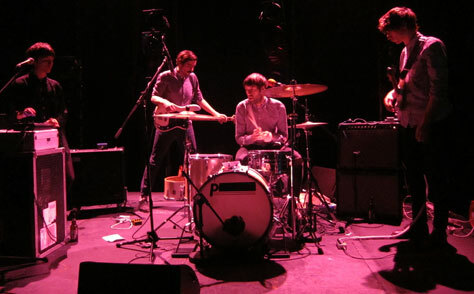 Sauna Youth’s debut album, Dreamlands, was released in 2012 through Gringo Records and Faux Discx, while their most recent 7-inch, False Jesii Pt. II, came out last year through Static Shock Records. They’re currently finishing off a new album. Monotony are evil twins of Sauna Youth, summoned from beyond the wall to destroy boredom. Like Chairs Missing-era Wire meets Kilslug or somethin’. 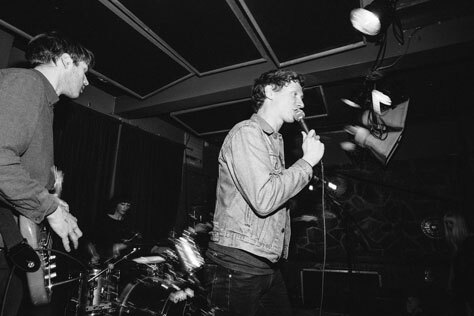 With the band(s) performing live on Marc Riley’s BBC 6 Music show on Monday and Tuesday evenings, this show offers the chance to see Sauna Youth and Monotony on the same bill. Local support comes from Waiters. The Eagle Inn is an excellent traditional pub from the team behind the Castle Hotel, the Parlour, Baker’s Vaults and Gullivers. It’s just off Trinity Way, an eight-minute walk from Manchester Cathedral on Deansgate. This show are co-promotions with Comfortable On A Tightrope. Buy tickets now. Tickets are available from Common (no booking fee), Piccadilly Records, Vinyl Exchange, Seetickets.com, WeGotTickets.com, Ticketline.co.uk and on 0871 220 0260.